MINNEAPOLIS — July 26, 2016 — Victory Motorcycles® has always focused on performance. The design brief for the very first Victory motorcycle was simple: build a motorcycle that’s more powerful and handles better than any other American cruiser. Eighteen years later, Victory remains dedicated to the pursuit of performance. For 2017, after achieving a 2nd place podium position at the Isle of Man TT with the Victory RR, becoming the 2nd and 3rd fastest motorcycles to climb Pikes Peak with the Empulse® RR and Project 156, accomplishing a circumnavigation of the globe in record time with Urs “Grizzly” Pedraita and his Victory Cross Country Tour®, and setting a Guinness World Record burnout with Joe “Vertical” Dryden aboard an Octane®, America’s most innovative and aggressive motorcycle manufacturer is geared up for its most powerful year ever, redefining what an America V-twin motorcycle can be. Whether it’s our 1200cc Octane®, five-model Cruiser family, Magnum®, Magnum® X-1 and best-selling Cross Country® Bagger models, Cross Country Tour® and Victory Vision® Touring models or electric Empulse® TT, these bikes are just the beginning of a new era in American motorcycle performance. THIS IS MODERN AMERICAN MUSCLE. THIS IS VICTORY®. Drop the clutch and light up that rear tire. Octane® makes it easy by following classic American musclecar formula: a powerful motor in a lightweight chassis. What’s left is just what you need to go very fast and without distraction. Featuring a high revving liquid-cooled 60-degree V-Twin with four-valve heads and dual-overhead cams that makes 104 horsepower and 76 foot-pounds of tire-shredding torque, Octane® has the heart of a Pikes Peak International Hill Climb™ racer and a 0-60 mph time that makes it the quickest Victory ever produced. But power is only half of the musclebike equation. There’s also a stiff and lightweight cast-aluminum frame, sharp steering geometry, a tight wheelbase, and 32 degrees of lean angle that together deliver agility previously unknown to American V-Twin motorcycles. Need more power? Need more sound? Check out the Victory’s Stage 2 Kit that includes an air intake and 2-1 exhaust to offer 10% more horsepower and 5% more torque. Fast, capable, stylish and affordable. Victory’s Octane® is the formula for the Modern American Musclebike. Available in Gloss Black ($9,999), Matte Super Steel Gray ($10,499), Matte Pearl White ($10,499) and Gloss Black with Graphics ($10,499). Take aim at the competition with this modern bobber, inspired by the original bobbers built by returning World War II vets who were hungry to recreate the adrenaline rush of flying a P-51 Mustang® fighter plane. Powered by the 106 cubic-inch Freedom® V-Twin mated to a smooth-shifting six-speed overdrive transmission, the Gunner has enough torque – 110 ft.-lb., in fact – available for takeoff. Combine that performance with the confidence inspiring riding position gained from a low 25-inch solo saddle and pullback handlebars, and you have the ideal recipe for a performance bobber. Available in Suede Titanium Metallic ($13,499) and Suede Sagebrush Green Metallic ($13,899). Raise your fists and leave the civilized world behind on High-Ball®. There’s no radio or radiator, no saddlebags or sissybar, nothing to take the attention away from the big-bore V-Twin sitting in the belly of this beast. Reach up and grab some attitude with the ape-hanger handlebars and let the 16-inch spoke-alloy wheels roll. New for 2017, choose from a new Suede Black color with black-wall tires ($13,499) or a new Suede Nuclear Sunset Orange ($13,749) color with white-wall tires. Drop the hammer on the competition with the Hammer S, the most aggressive cruiser in Victory’s lineup. Equipped with a big-block Freedom® 106 V-Twin engine, burly inverted fork and a pair of strong-stopping four-piston brake calipers that look like they came off of a sportbike, extra wide pro stock-inspired 250-series rear rubber, a sleek rear cowl with a hideaway passenger pad and bodywork wrapped in musclecar racing stripes, the Hammer S is a streetfighter with an American soul. Available in Gloss Black with White Racing Stripes ($15,599). Put some power into your profile with the Freedom® 106-powered Vegas®. Featuring clean custom styling, a color-matched frame, and a contrast-cut 21-inch front wheel, Vegas® is the cleanest looking and most powerful factory custom made today. Check out the tucked-in headlamp, 21-inch contrast-cut Falchion™ front wheel, elegant pullback handlebars, slash-cut muffler tips, flush-mount LED taillight, and blacked-out details that make the rich Sunset Red metallic paint with matching frame really pop. Of course, since this is a Victory, the Vegas isn’t all show. With the same Freedom® 106/six-speed overdrive combination as the rest of the Cruiser lineup, Vegas packs more than enough power to knockout any stoplight challengers, too. Available in Sunset Red ($13,999) with color-matched frame. Sinister and blacked out, sparse use of chrome details, and a 21-inch contrast-cut Falchion™ front wheel named after a sword known for its versatility and ready to slice out plenty of attention. This is the Vegas® 8-Ball. Front to back, the Vegas® 8-Ball is sculpted by a tucked-in headlamp, chrome gauge cluster, black risers and pullback handlebars, slash-cut muffler tips and a flush-mount LED taillight. Like its sibling, it runs on a Freedom® 106 V-Twin producing 110 Ft.-Lbs. of pulse-pounding torque mated to a smooth six-speed overdrive transmission. Available in Gloss Black ($12,999). The 2017 Magnum® X-1 takes the stage powered by a 200-watt 10-speaker surround sound audio system. Loaded with custom features such as contrast-cut billet wheels – featuring a 21-inch front – a new custom paint scheme and LED lighting, this may be the only motorcycle on the market that attracts both custom motorcycle fans and concert groupies. Available in Pearl White with Platinum overlay and Electric Red pinstriping ($24,499). 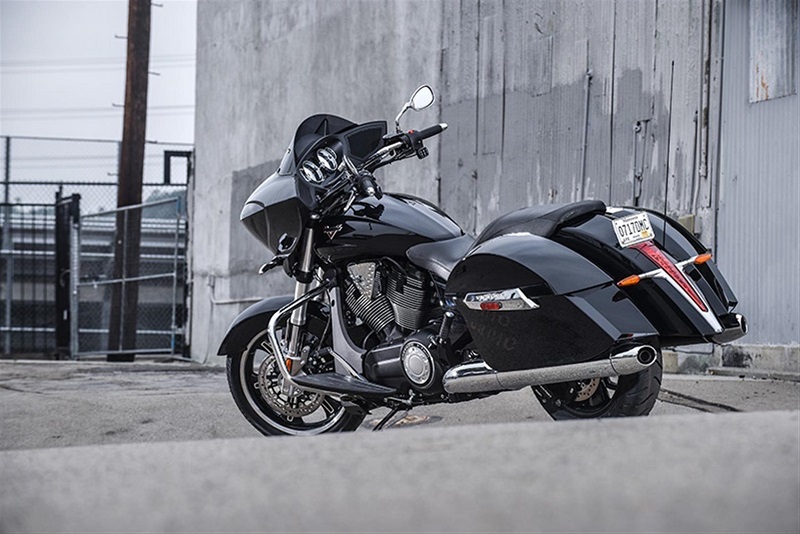 Move boldly through your world on the Magnum® muscle bagger. With a larger-than-life 21-inch front wheel – the biggest wheel ever fit to a production bagger – LED headlight and new muscle colors that demand attention, Magnum makes a mark on anyone who sees it. Turn on the cruise control, crank up the high-performance Bluetooth®-enabled audio system blasting 100 watts from 6 speakers, and enjoy the ride knowing that anti-lock brakes monitor your traction at all times. Available in Gloss Black with graphics ($22,599), Habanero Inferno Orange with graphics ($23,099) and Indy Red Pearl with graphics ($23,099). Lead your pack anywhere with the overachieving Victory Cross Country® bagger, now with even more standard features including ABS, cruise control and Bluetooth-enabled audio. Powered by our 106 cubic inch Freedom V-Twin delivering best-in-class horsepower and 106 ft-lb of torque, the Cross Country® is a muscular bagger aided in its smooth running nature by inverted front fork, air-adjustable rear monoshock and dual front disc brakes with standard ABS. Carry along what’s important, and make sure it stays secure and dry in 21.3 gallon, lockable, weatherproof sealed saddlebags. Keep entertained with a standard AM/FM/Weather radio with Bluetooth capability to allow you to use your MP3/iPod® as your music source, and amplify your riding experience with premium speakers that deliver powerful, crystal-clear sound. Want to increase your muscle mass? The “Made For Victory By S&S®” Stage 2 Kit – S&S® cams and high-flow air dam together with an available Victory Accessory exhaust system – offers 20% more horsepower and 10% more torque for Cross Country, Cross Country Tour and Magnum models. Available in Gloss Black ($19,499), Suede White Frost ($19,999), Suede Nuclear Sunset Orange ($19,999) and Sunset Red ($19,999). Cross America in record time. Take the standard Cross Country® bagger – a capable platform for any two-wheeled adventure – hit it with a dose of comfort and convenience features like a 200W eight-speaker Bluetooth® and USB audio system, and what you get is the Cross Country Tour: a V-Twin touring bike ready to go anywhere comfortable and quickly. So set ambitious destinations with the Cross Country Tour®, which offers the largest total cargo capacity on a production touring motorcycle (41.1 gallons). Victory’s Comfort Control System provides upper and lower air controls that channel the wind to maximize comfort while a padded passenger backrest, three-position adjustable floorboards and dual zone heated seats give your passengers the control they deserve. An air-adjustable rear suspension further aids rider and passenger comfort while ABS and new LED lighting helps keep your mind at ease. Available in Gloss Black ($21,999), Gloss Blue Fire ($22,499) and Two-tone Turbo Silver and Black ($22,999). What if you cast off all convention and set out to build the ultimate American touring bike without any rules or restrictions on how that bike had to look, feel or act? The result would be the Victory Vision – America’s most comfortable touring bike. The Vision’s full-coverage fairing, sculpted in the wind tunnel, provides unprecedented comfort and protection. And because the fairing is mounted to the frame and not the handlebars, steering remains light and predictable. Underneath the innovative bodywork are the same capable underpinnings as all the Victory baggers and tourers, including the extra-rigid cast aluminum frame, air-adjustable rear suspension, and of course a gleaming example of the same four-valve overhead-cam Freedom® 106 V-Twin that delivers such unexpectedly brisk acceleration. Add to that a power windshield that turns wind resistance into your plaything, standard ABS and cruise control that instill confidence, a heated seat and heated grips that keep you rolling year round, and 29 gallons of storage capacity with enough room for two no matter where adventure takes you. Available in Gloss Black ($21,099) and Gloss Blue Fire ($22,099). We’re equal opportunity speed freaks. Whether it burns hydrocarbons or kilowatt-hours, we don’t care as long as it’s fast. The Empulse® TT is fast where it matters most. Built on the same platform that claimed a spot on the podium at both the Isle of Man and the Pikes Peak International Hill Climb™, the Empulse® TT accelerates up to 100+ MPH and has a 10.4 kWh battery module that can fully charge in 3.9 hours. Equipped with sport-tuned inverted front forks and an adjustable suspension to provide track-level performance, the Empulse® TT is also the only electric bike equipped with a gearbox – a six-speed transmission – although shifting is entirely optional as it also operates in a twist-and-go mode for maximum convenience. The Empulse® TT … the only electric motorcycle available from a major motorcycle manufacturer, putting it in a class of one. Everyone else is still catching up. This is American muscle at its most modern. Available in Titanium Silver with Havasu Red ($19,999). Increased power. More standard amenities. Amplified style. Victory Motorcycles®. Learn more about Victory Motorcycles’ 2017 lineup at VictoryMotorcycles.com. I just don’t like the looks. IT just tries too hard and doesn’t come natural. I do like liquid cooled and teh modern engineering, but I don’t think liquid cooled is in the full sized tourers, just the smaller motorcycles. It doesn’t say for sure. I once had a Victory Touring Cruiser. A 2002. Then they went with the “Nessie” look, they lost me. Plus, some of the guys on Victorys are kind of, well, an odd lot. The Vision still can’t carry more than a small loaf of sliced bread in either saddlebag. Ridiculous. Having ridden one at a demo day, I can say it is a great ride neutered by puny saddlebags and a bad stereo. At last year’s show in Long Belch, a Victory rep said they would never update the Vision. Too bad as it’s far more comfortable than the current (and in dire need of updating itself) Goldwing or either current model of Harley Ultra. BMW? No way would I ride a “Bring My Wallet” any distance as I would be constantly thinking about how much the impending tune-up was going to cost me. Moto Guzzi 1400 California? No. Horrid real world mpg keeps it off my real personal list of next touring rigs. I have owned my current touring mount (GL1800) for over 10 years and am seriously looking to replace it. If the rumors of HD’s new touring bikes having solid lifters is true, then they are forever off the table unless they can at least match the Goldwing’s 32,000 mile service/check intervals. Victory’s touring bikes are very, very good but need to have their stereos updated along with switchgear. And again, the Vision needs to have the bags from the Cross Country Tour grafted onto them along with the same stereo/switchgear updates. Little new from Victory. The touring bikes remain unchanged, ssame engine and transmission since forever. No tweaking. The brand has become boring. I would think much of the engineering and development money is currently going into the flagship Indian line. As a result, Victory has become Polaris’ second tier brand. Hate to see that happen, but it’s business. As the buying public, we can pooh-pooh their “Modern American Muscle” claims all we want, but until somebody else in this country starts producing bikes at more than a hobby level (EBR) or at a reasonably attainable price point (Motus), they kind of own it. Harley certainly can’t touch them, and Indian is only interested in being a little better than Harley, so it’s Victory’s game. I do find it interesting that the added performance package available from the factory in ’17 (stage 2 cams and exhaust package) is only available for the baggers and not for any of the steel frame bikes for which they make all these hot rod claims. Apparently you didn’t read the whole article. While Harley may have won the HP battle by a 1/2 horse (would that be a pony? ), Indian won the torque contest by a wide margin. I agree with the “American Muscle indeed” comment. Engine’s make power. Unfortunately, the industry gives us silly peak hp numbers. The important number is the area under the entire power curve. That is the total power the engine is capable of producing. We never see it, so we run around bragging on a peak value that lasts but an instant if we even get to it. And if we do, it will quickly be nullified by hitting the rev limiter. Engine torque is a component of power. It is nothing you feel. The torque at the rear wheel is a matter of gearing. Don’t believe me? Take the same engine. Put the bike in first gear. Take off. Torquey eh? Now repeat the test with the bike in sixth gear. Not so torquey, eh? Why not? Same engine, same power, what happened to that torque?